J.R.R. Tolkien's The Lord of the Rings trilogy is a genuine masterpiece. The most widely read and influential fantasy epic of all time, it is also quite simply one of the most memorable and beloved tales ever told. Originally published in 1954, The Lord of the Rings set the framework upon which all epic/quest fantasy since has been built. Through the urgings of the enigmatic wizard Gandalf, young hobbit Frodo Baggins embarks on an urgent, incredibly treacherous journey to destroy the One Ring. This ring - created and then lost by the Dark Lord, Sauron, centuries earlier - is a weapon of evil, one that Sauron desperately wants returned to him. With the power of the ring once again his own, the Dark Lord will unleash his wrath upon all of Middle-earth. The only way to prevent this horrible fate from becoming reality is to return the Ring to Mordor, the only place it can be destroyed. Unfortunately for our heroes, Mordor is also Sauron's lair. The Lord of the Rings trilogy is essential reading not only for fans of fantasy but for lovers of classic literature as well. Some like to play games, for example visit here, before reading the books out loud... you should maybe try that one day? George Allen & Unwin, Ltd. of London published the first edition of The Fellowship of the Ring (the first part of Lord of the Rings) on 29 July of 1954. This printing numbered a mere 3,000 copies. On 11 November of 1954 the second part, The Two Towers was printed. There were 3.250 copies made of that run. Followed on the 20th of October 1955 by 7.000 copies of the Return of the King. All three feature the jacket design by Tolkien, which is called the Ring and Eye device. Houghton Mifflin of Boston and New York prepared an American edition to be released in October 1954 of the Fellowship of the Ring. They imported the sheets from Allen & Unwin and bound 1.500 copies. 1955 brought the Americans The Two Towers on the 32st of April. 1.000 copies only were bound, again from imported sheets. Early 1956, on January the 5th there were bound 5.000 books of The Return of the King, againfrom sheets of Allen & Unwin. 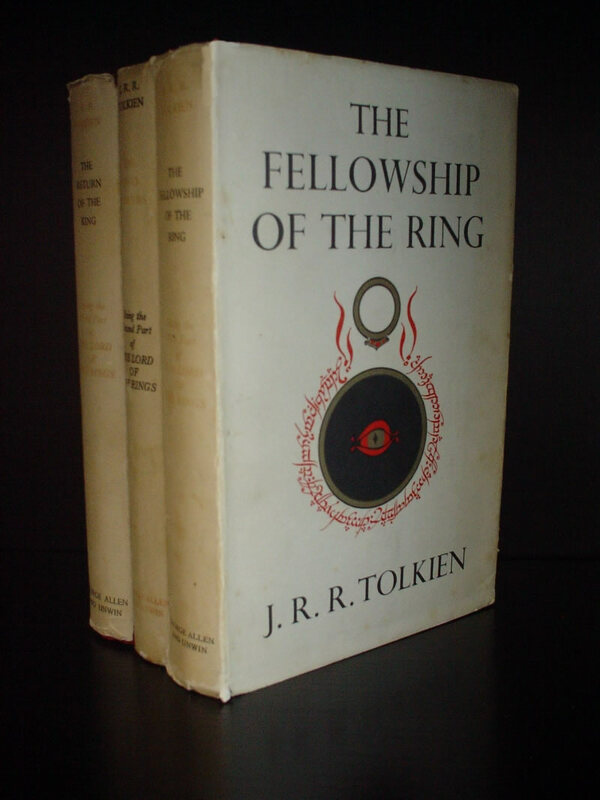 In 1965 appeared the now famous first (unauthorized) paperback edition of The Fellowship of the Ring, the Two Towers and The Return of the King by ACE books. The made 150.000 copies of each, but after settling the copyright despute never published The Lord of the Rings again. Actually the changes and editions are so numorous you can write a book about it. I hope to find the time to tell all about all different editions out there and show you the real rare ones... when i find the time. Until then read J.R.R. Tolkien: A descriptive Bibliography from Wayne Hammond.